The Postgraduate Medical Education Council of Tasmania is the organisation responsible for prevocational medical education in Tasmania. 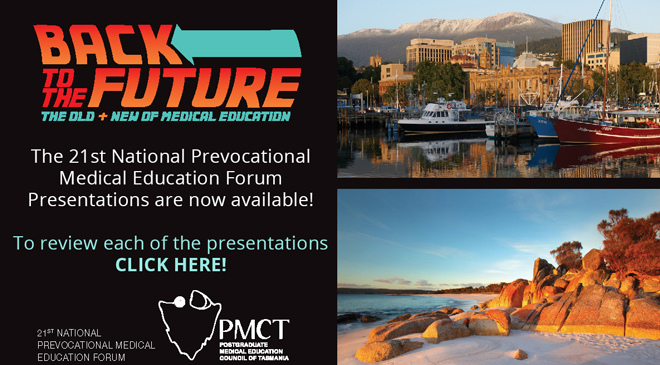 The 21st National Prevocational Medical Education Forum Presentations are now available! The Tasmanian Junior Medical Officers' (JMO) Forum is a group open to all junior doctors working in the Tasmanian public hospital system. It provides a platform for discussing issues relating to the education, training, accreditation and wellbeing of junior doctors across the state. The JMO Forum meets every second month via video-conference, and in 2017 has representatives from the Royal Hobart Hospital, Launceston General Hospital and North West Regional Hospital. The JMO Forum is closely linked with the Postgraduate Medical Education Council of Tasmania (PMCT). We represent JMOs on the PMCT Board and several sub committees, and assist with the accreditation process for intern and RMO terms within Tasmania. We are also a member of the Australasian Junior Medical Officers' Committee, giving us a national voice and perspective on JMO issues.